Chief Constable Sir Clinton Driffield is on holiday for once, going to visit his friend “Squire” Wendover for a spot of fishing. The morning after arriving, though, he is roused at an early hour and called to help in a murder enquiry. A local gamekeeper has been found by the boathouse, shot to death with his own gun. As investigations proceed it seems as if everyone in the vicinity may have visited the boathouse at some point that night. With the local land-owner’s wife missing and a second body waiting to be found, it seems that the case is going to get a lot more complicated before things get resolved. Alfred Walter Stewart, under the pseudonym J J Connington, wrote twenty five mysteries, seventeen (according to Goodreads, at least) feature Sir Clinton Driffield. I’ve already reviewed Murder In The Maze (Book 1, I think) and The Case With Nine Solutions (Book 4?) and this is the sixth Driffield outing. It’s different from what you might expect. It’s a classic mystery in every sense of the word. The plot is logically thought out with plenty of clues for the viewer to latch on to. There are plenty of layers to the mystery and there’s a logical trail to the solution. But… it’s a curiously detached affair. We exclusively follow Driffield around the whole time and there is little chance to get a feel for the characters involved in the crime. He talks to each of the characters exactly once before the denouement. By only seeing the investigation, it makes it hard to get particularly involved in the tale beyond a logic problem. It doesn’t help that Driffield is a know-it-all who seems to deduce the entire solution immediately and then, when some small clue is discovered, he insists on saying that he expected that. Kind of annoying. I know Poirot does that sometimes, but he keeps it to himself until the end. So, overall, it’s well worth a look, but it is a little dry in places. Worth a look. I’m still waiting for my review copy, Curtis 🙂 It will be a pleasure to read you book as a guide to all these books I have yet to discover – a treat long overdue. I have just obtained The Castleford Conundrum. This is the first J J Connington I am going to read. I shall comment on it after finishing reading. If you could wait until I’ve read that one, it would be appreciated. I don’t understand ! Do you mean that you do not want comments on books you have not read ? However, if you do not want my comments , I shall certainly not give them ! Incidentally, The Castleford Conundrum has been praised by several people including The Passing Tramp, Les Blatt and Patrick Ohl. This influenced me to buy the book. I’d rather not have a discussion started on a book that I haven’t read as I’d like, as usual, to have as little information as possible when reading a mystery novel. There are plenty of other blogs where the book has already been reviewed which might be a more appropriate place to discuss it. I agree about Connington’s dryness. I read a handful of his later books and then when I stumbled onto a copy of his very first mystery novel (DEATH AT SWAYTHLING COURT and without Driffield) I was taken aback at how funny it was. I don’t know if Orion reprinted that one but you might want to locate a copy. The difference between his first — it’s almost a parody, really — and his later Driffield books is drastic. I think THE SWEEPSTAKES MURDER (a Driffield novel) is kind of brilliant, though once again it gets a bit cerebral in the telling. MURDER IN THE MAZE has been reviewed favorably multiple times on various vintage crime blogs, but I’ve not read that one. The other two I mentioned in this comment have been reviewed on my blog. Click on my name to be taken to the blog, then enter Connington in the upper left hand search box and both will come up. 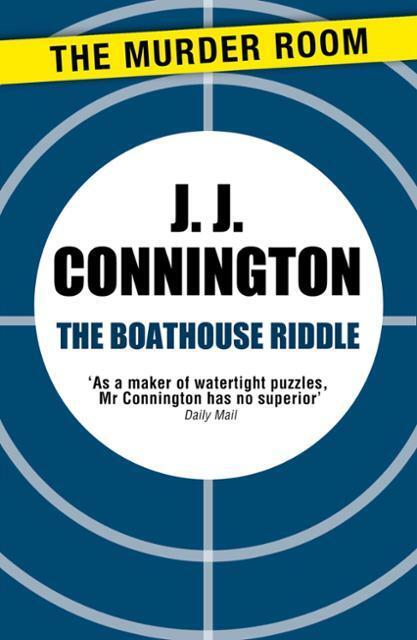 Boathouse has gotten some praise and is certainly competent, but it’s not one of my favorite Conningtons, as I explain in the intro to the Murder Room series. Driffield is not the warmest of detectives, though he has a certain dry wit. I think he definitely reflects the personality of the author (see Masters). The only Connington I’ve read is THE EYE IN THE MUSEUM (so long ago that now that I own it I need to reread it). I also have MURDER IN THE MAZE and (thanks to Johns’ generosity) DEATH AT SWAYTHLING COURT waiting for me to get to that portion of my TBR mountain. I remember liking EYE…but I couldn’t tell you why. I think so far with Connington, it’s a case of admiring rather than enjoying, which is a bit of a shame. But maybe I haven’t read the right one yet.